Over the course of his interview for the NJEA Review, Ambassador Phil Murphy used the phrase “a steel backbone” several times to describe a trait the next governor of New Jersey will need, particularly in response to the anti-public education and anti-immigration policies coming out of Washington. But the next governor will also need a steel backbone to do battle with the forces arrayed against full and fair funding for the state’s public schools, full funding of the pension system, and to repair the damage done over the last eight years by the Christie-Guadagno administration. 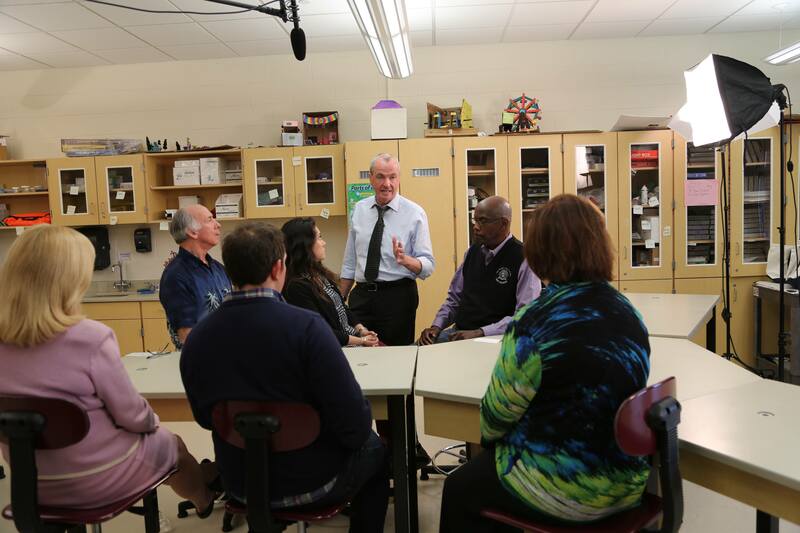 One thing became clear during the interview: NJEA’s PAC-endorsed candidate for governor, Ambassador Phil Murphy, is up to the challenge. A product of public education, Murphy is a 1975 graduate of Needham High School outside, of Boston, Massachusetts. The youngest of a family of four, the future businessman and ambassador to Germany describes the working-class family in which he grew up as “middle class on a good day.” With loans and part-time jobs, Murphy earned a degree in economics from Harvard and an MBA from the Wharton School of the University of Pennsylvania. With his wife, Tammy, Murphy went on to raise his own family of four in Monmouth County. Together, the Murphys have been engaged in a variety of civic and charitable enterprises. Murphy is no stranger to the financial issues that plague the state. In 2005, Gov. Richard Codey tapped him to chair the New Jersey Benefits Task Force—an experience that has given him a deep understanding of the pension and benefits issues and the burdens borne by NJEA members and all state and local public employees. Last month, Murphy sat down with NJEA Review editor, Patrick Rumaker, at NJEA headquarters in Trenton to have a conversation about the issues that matter to teachers and educational support professionals. The questions and answers follow. Can you talk about a particularly memorable experience from your school days? With educational support professionals (ESPs), one of the things I remember from my time as a student is that every person I came into contact with during the school day—whether he or she was bus driver, someone who served me lunch, or a custodian—was an educator in one form or another. I believe that every adult a student comes in contact with during the school day is an educator in the eyes of that child. That student is not making a distinction, and neither should we. What do you believe are the essential components of a great public education? It starts with educators and real resources. Educators are the heroes who go in every day with a laser focus on learning and getting the most out of our precious kids, regardless of their circumstances. And schools need to be funded. As good as educators might be, if we don’t put resources behind them to support them, they will not achieve their maximum potential. We’re going to have to move as fast as we can to full funding for SFRA (the School Funding Reform Act), which, at the time it was passed, was viewed to be a national landmark school funding formula because it was a bottom-up approach—it asked the tough questions that you have to ask when you recognize that not every child is born with the same luck or the same set of circumstances. It won’t be easy. We’re going to have to re-order our priorities, but if we’re not putting our kids and their education first, who are we as a government? I would invite them to read the whole “book” of my life. Like any of us, my life is a book filled with many chapters. Working in financial services is one of them. I would argue that some skills that I learned in that chapter of my life are quite relevant to a state with a broken economy—an economy that must be stronger and more fair and work for everyone. Whether it’s having seen countless models—good and bad—of how jobs are created, or dealing with rating agencies in a state that has been downgraded 11 straight times, those skills matter. But more broadly, there are a lot of other chapters. I chaired the board of one of the premier domestic violence organizations in this state, I recently stepped down from the board of the NAACP, I chaired the original commission on pension and health care benefits for public sector employees, and I’m a dad of four: ages 20, 18, 16, and 14. But I think “Chapter 1” of my book is the most relevant in terms of why I’m running for governor. I grew up in a family, the youngest of four, with a dad who didn’t graduate high school and a mom who did. She made sure we were educated. He made sure we cared about the community—politics and service. We were working poor. I could go on, but before you assess me on one chapter of my life—although read that chapter carefully and see if there’s relevance to New Jersey’s economy right now—read the whole book. We have an overwhelming number of public-sector employees and educators, whether they be classroom or ESP, who are taking home less pay today than they did seven years ago. And in those seven years, we’ve had a complete failure of leadership to do anything about it. How will you balance New Jersey’s concern about taxes with the need for additional revenues to pay for critical public services? A budget screams out your priorities, and we’ve had almost eight years of priorities that are not consistent with funding public education in this state. We have an economy that’s among the weakest in the country. It’s profoundly unfair, and it works for very few of us. The current administration has made questionable choices. They’ve funded tax breaks for big corporations—about $8 billion—to either stay in New Jersey or to come here. But they have underfunded the one school funding formula—the only one that’s ever been blessed by the Supreme Court of this state—by nearly that same amount, about $9 billion. People rightfully complain about their property taxes, and a big share of most communities’ property tax is the education piece. If you take that $8 billion in tax breaks and spread it around to the communities in our state, our property tax reality would be a lot different and in a better place than it is today. Teachers and ESPs have not felt respected by the current governor either as professionals or as members of a union. What would be different under a Murphy administration? The tone of the relationship between the governor and educators, including ESPs, if we’re fortunate enough to be elected, changes like a light switch the minute we take office. We have substantive challenges to work through. Some of the big challenges—pensions, standardized testing, school funding, to pick three big ones—those are hard, but we’ll be at the same table with our sleeves rolled up, working on that stuff together. Why would we need, on top of that, the vilification, the name-calling, the shut-up-and-sit-down that the Christie-Guadagno administration has embodied for the past seven years? I don’t know what it’s gotten us. It certainly hasn’t helped to change the substance of the challenges that we’re dealing with. Is there a policy issue that is near and dear to your heart—not necessarily related to public education—that you hope will be something you accomplish as governor? One idea I love is a public bank. Instead of putting all of our revenues in Wall Street banks or foreign banks or big corporations that operate elsewhere, let’s start a bank that the citizens of this state own and that does all of its business in New Jersey. The bank could offer student loans at much more reasonable rates and lend to small businesses and to small-scale infrastructure projects. Another policy area is our vision for a 100 percent clean energy future in New Jersey by the year 2050. This includes ideas such as reigniting solar, rejoining the Regional Greenhouse Gas Initiative, and rewarding utilities not just for building big 300-megawatt plants, but for leading conservation efforts that save us 300 megawatts. We have the potential to generate an enormous amount of our energy needs through offshore wind. We think we can get to 3,500 megawatts of offshore wind power by the year 2030. That’s enough to power a million-and-a-half homes. And we need to focus on environmental justice—getting at the environmental challenges that are in our urban communities where you’ve got high rates of asthma among our kids in places like Newark because of all the truck traffic and other traffic in the ports. You have spoken publicly of your opposition to privatization of public-sector jobs, including those of educational support professionals. Could you expand on why you hold this view? Privatization has, from time to time, been one of those bright, shiny things that look really alluring. And I found myself in the distant past even being sucked into that—saying, boy, that looks like that might be appealing. The fact of the matter is that privatization unambiguously ends in tears for everybody: certainly in this case for the educator—the employee of any kind. Certainly, as well, for the public-sector provider, whatever that might be—a school system or a municipality—and, thirdly, the end user of whatever that service was, is almost always underserved. In this case, kids. So you’ve got a lose-lose-lose situation. The kid loses, the ESP individual loses, and the school district loses. I’m not an opponent of privatization because I’m a bleeding-heart sympathizer; I’m opposed to it because it doesn’t achieve the results that it promises. Charter schools are a complex issue. On the one hand, NJEA opposes the unchecked expansion of charter schools and we are deeply concerned about the fiscal impact of a charter school on the local school district’s budget. On the other hand, we are concerned about the working conditions of the public school teachers and other public employees working in those schools, so we are organizing the staffs of charter schools as members of NJEA. What is your view of the role of charter schools in public education? I’ve never been “hell no” when it comes to charters. But I have been “hell no” in the way they’ve been promulgated too often in this state. There are too many open questions, there are too many inequities, there are too many consequences—including some I’d say in fairness that are unintended. Let’s make sure we understand what the consequences are. What’s the right funding formula? And what are the consequences of that? What are the standards that we’re holding educators to? Are they similar standards? Is there consistency in the certifications of the schools and in the regularity of review? What are the demographic impacts? That’s a very different debate in Newark than it is in Red Bank. I live across the river from Red Bank, which has a growing Latino community. If you look at the demographics in the charter school there—the school wanted to expand but there was no local appetite for it and it was beaten back. The demographics of the charter school versus the demographics of the district system—it’s a highly skewed reality. That’s not what folks have signed up for. U.S. Secretary of Education Betsy DeVos is a staunch proponent of vouchers and for-profit, unregulated charter schools. Federal education policy may tie federal grants to the enactment of private school voucher schemes and a drastic relaxation of charter school regulations. How will you protect New Jersey’s public schools? I am exceedingly underwhelmed and disheartened by Betsy DeVos’ leadership. I can extend that to President Trump’s leadership, but hers is a good example of wrong-headed leadership that doesn’t care about the facts, certainly hasn’t read American history, and doesn’t look at the reality on the ground. I think you can have a robust district/charter discussion, but there’s no robust discussion when you start taking money out of the system for vouchers, so I’m a big opponent of vouchers. I am against reducing regulations for charters, reducing charter governance standards, and for-profit charters. We need accountability. We need a system and a balance that works and is sensible. I believe, and I hope I’m right, that there’s enough support even across the aisle, whether it’s in New Jersey or at the federal level, that sees this discussion in a much more moderate, reasonable light, than the sort of right-wing, agenda-driven policies that are being put forward. We need leaders who have an open mind, who are willing to look at all sides of an issue. Unfortunately, in DeVos’ case, that’s not the leadership that we have. As governor, what will you do to ensure more funding in our pension system so that the state’s obligation is met? My experience with the pension crisis dates back 12 years. I chaired the original commission on pension and health care benefits for public-sector employees in this state. I learned then that this problem began in the ‘90s. And over 20 years later, we have continued, in too many respects across generations of leadership, to kick the can down the road. One could certainly argue that we’ve left public-sector employees at the altar time and time again. Often “deals” were jammed down the throats of the public-sector employees, including educators. Collective bargaining rights were trampled. The lines that distinguished what one could do as a legislative matter versus as a collectively bargained matter were too many times completely ignored. We have, as a result, not only disappointed educators, police, fire, other public sector employees, but we’ve become—not just because of this, but largely because of this—a state the people don’t trust. We must become a state that is trusted again. 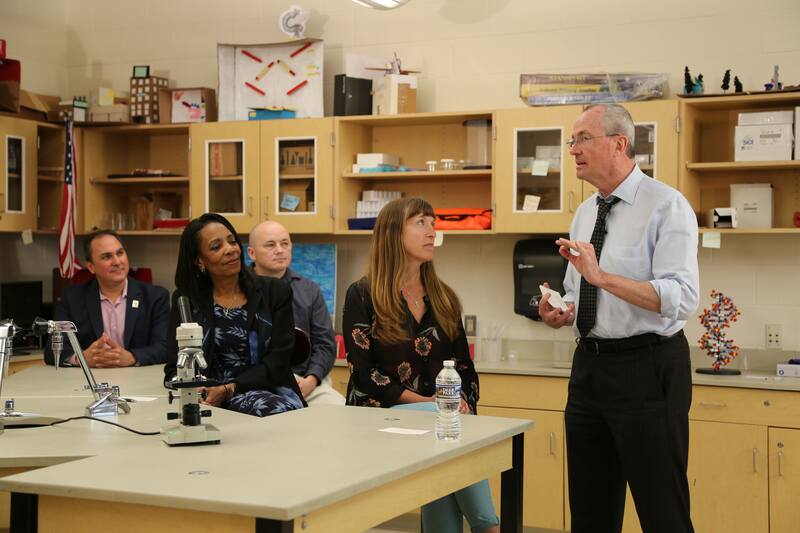 Ambassador Phil Murphy meets with NJEA members in Ocean County on May 12. Because of Chapter 78’s increasing health care contributions and increasing employee pension contributions, NJEA members have seen annual decreases in their take-home pay. And on top of that, retirees have lost the cost of living adjustment (COLA). What can you do to reverse this trend so that teachers and ESP are able to keep what they earn? We have an overwhelming number of public-sector employees and educators, whether they be classroom or ESP, who are taking home less pay today than they did seven years ago. And in those seven years, we’ve had a complete failure of leadership to do anything about it. The governor and lieutenant governor have been completely tone deaf about the health care premium reality and show a lack of acknowledgement, a lack of willingness to work with the unions on creative solutions here, that would allow us to limit this. Public school employees should not continue to see their take-home pay decrease. I will work with all stakeholders to address the impact of Chapter 78. There’s another point I want to emphasize. Collective bargaining is the “Intel chip” inside organized labor. When you open your laptop there’s a little logo that says “Intel inside”—it’s the semiconductor chip at its heart that makes that laptop hum. In my humble opinion, collective bargaining is the chip inside the notion of organized labor. Adults, going into a room, yelling at each other, maybe taking days, weeks, months, but coming out with deals that were compromised and agreed upon. And you know, I may not like everything about the deal, you may not like everything about the deal, but that’s the deal. And we did it ourselves, we’re going recommend it to both sides and go forward. That’s the essence of organized labor. Chapter 78, in addition to all the harm it did to take-home pay and the COLA, the concept of organized labor was shattered. And so we need leadership that not only understands the economic reality that individuals are up against, that understands this broader trust reality, but also restores that chip, that essential element, that is the essence of organized labor. What protections should be in place in our public schools for students whose parents are undocumented, or who themselves might be undocumented? Before I ever thought Donald Trump would be president, we were talking about things like statewide identification cards for everybody and access to a driver’s license regardless of status. For Dreamers, we want not just access to in-state tuition in higher education, but to in-state financial aid. I would say to anybody who’s in this state and is peaceful and law-abiding, our doors are open. Our arms are open. You are welcome, and we will do all that we can to stand up to this president. We need, more than ever before, comprehensive federal immigration reform. I think it has to come from Republican courage, not just our side of the aisle. President George W. Bush wanted to see comprehensive immigration reform. But for the time being, we’re going to stand by the promises that were made as a policy matter and stand up to this president. We’re going to establish an Office of Immigrant Protection or Immigrant Defense at the state level. It will be a single point of contact where folks can call up regardless of status and ask their questions and get the best advice possible. Tell me how you arrived at Assembly Speaker Sheila Oliver as your choice and the role you see her playing in your administration. I’m so honored to be on the ticket with Sheila Oliver. Both my wife and I have gotten to know Sheila over the past several years. We instantly had chemistry with her. We realized we were born under similar stars. We both come from hard-scrabble backgrounds. We see issues in a similar light. In addition to her spirit, her intellect, her educational background, her compassion and her understanding of the issues, her experience is jaw-dropping. Sheila has been in and around government at the community, county, and statewide level. Somebody said this to me, it was not my term, but someone said to me it was a Joe Biden pick. And I thought that had a ring to it. That somebody like Biden who had 30-odd years of experience, in his case in Washington, Sheila has that 30-odd years of experience in the New Jersey scene. 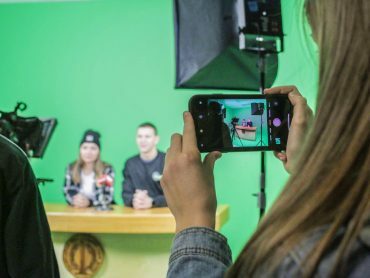 New Jersey’s community colleges were founded on the basic funding principle of one-third funding from the state, one-third from the local counties, and one-third from student tuition and fees. State and county contributions are far from that ideal—leaving students to pay increasing higher tuition and fees. How will you address community college funding? On community college funding, our first step ought to be to get the state’s role back up to the 33 percent. That’s the deal, and it needs to get there. I’d like to have a more heroic objective. Only three states, I believe, in the nation have universal pre-K and three other states have free community college. I’d like to be on both of those lists. I can’t promise you that we can do that overnight, but we’ve got to find the money, and I’ll admit to you that’s not going to be easy. But as a first step, let’s get the state back to meeting its end of the bargain. I’ve already mentioned the creation of public bank with more reasonable student loan terms, but let’s be more creative. We’ve got several challenges: college is unaffordable, too many of our high school seniors leave for colleges in other states, and we’re falling behind in the STEAM (science, technology, engineering, the arts, mathematics) economy. So how about this? 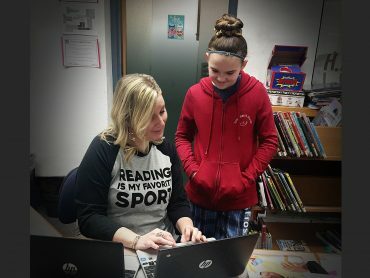 If the student stays in New Jersey to go to school, majors in a STEAM field, graduates, and stays in a job in the STEAM field for five years, that we have a state program that in Year 6, 7, 8, 9, and 10 forgives “X” thousands of dollars right off the top of their outstanding student loans. Look what we would have done: kept the student in the state, unburdened a big piece of the college-affordability question, and directed folks into the part of the economy that you want to put policy and muscle behind to grow. I believe that we want to know how our students are doing, but the way that we’re assessing student learning in this state, makes little sense. I have been a vocal critic of PARCC. High-stakes, high-stress standardized tests in New Jersey must end, and I will see that they do. We must get back to the simple premise of letting teachers use classroom time to teach to their students’ needs, and not to a test. Too much emphasis is being put on a single test. I’m all for assessments, but how about more nimble, more regular assessments with shorter feedback loops? How about that testing being administered and directed by the folks who should be administering and directing it: the educators in the classroom who are the closest to our kids. 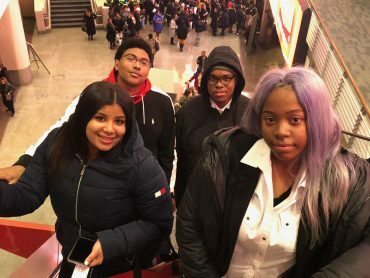 While I think you have to meet standards to graduate—let there be no doubt about that—a high-stakes test such as PARCC to me is not the way to do it. I think we can be much smarter about high school graduation requirements. Phil Murphy is NJEA’s endorsed candidate for governor. That election, along with elections for all members of the Legislature, will take place on Nov. 7. If we’re not putting our kids and their education first, who are we as a government?